Australians must get darned sick and tired of the merry-go-round of Party Politics. In New South Wales and Queensland voters have long suffered the extravagant splurge, ballooning public service and half-baked policies of Labor that have dragged their respective states into massive debt black holes. Tens of billions were wasted. Having voted out the Labor incompetent aristocracies, now voters in both New South Wales and Queensland are on the receiving end of their respective Liberal Party’s own aristocratic austerity, privatisation and public service redundancies. It is a rebounding party politics pattern in the extreme. Liberal and Labor (LibLabs) are as similar ideologically as were past PM’s Gough Whitlam and Malcolm Fraser, who are best mates! LibLabs take turns in power, each coming in gloating after an election, imperious with a sense of God-given mandate to railroad their party agenda unto the voters. And this is democratic Australia? As the respective terms of each LibLab faction matures, whether it be Libs or Labs, their obstinacy and perverse sense of self-righteousness, will see them tragically fall on their electoral sword. Australians don’t desevre to be condemned to an alternating Lib-Labs-Lib-Labs-Lib-Labs oligarchy. But party politics has taken over Australian politics and Australians need to realise this. 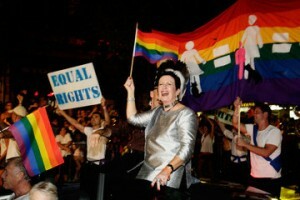 The Labor Party accuses The Greens of being extreme – well frankly the Greens are worse! Australian jobs, housing, rents, childcare, schooling, transport congestion, cost of living rises, infrastructure cost hikes – like electricity and desalination plants. It is no wonder that the informal vote by Australians has grown. No wonder Australian teenagers are no longer bothered registering to vote once they turn 18 years. What is the point? Same shite, different party – Libs?, Labs?, Greens? – flavours of shite! Look at what NSW Premier Barry O’Farrell’s fascist austerity has served on the NSW north coast community of Grafton this week. 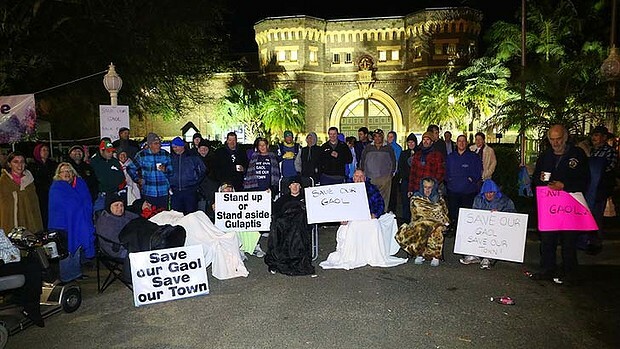 Grafton Gaol, its hundred odd year heritage, many workers there for over 25 years have without warning got two week’s notice from O’Farrell’s new Liberal Government. NSW Liberals’ game plan is about saving money. This is their ‘ELECTORAL MANDATE’. So O’Farrell by shifting Grafton Gaol prisoners over 300 km away to Cessnock will save money. So with just 2 weeks notice O’Farrell’s heavies ordered the closing of Grafton’s largest NSW Government employer – Grafton Gaol (or most thereof). No relocations, no consultations, Government just turned its back on Grafton. Despite the loyal Grafton community rallying around the gaol workers, the Liberals on Wednesday called in the Riot Squad. One hundred and eight government workers are sacked by O’Farrell deploying his Riot Squad by phone from Sydney. So one hundred and eight dependent families now have lost their breadwinner income, cannot afford mortgages on their homes, cannot support their kids. Grafton is another regional Australian community condemmed on the scrap heap due to Party Political policy whim! Recall Australian History: Didn’t the Victorian Government send in the troops to Ballaarat in 1854 to forcefully put down democratic miners at Eureka Stockade? So NSW Labor under Carr, Iemma, Rees then Keneally raided taxpayer’s Treasury wealth to execute a Labor Party selfish agenda until tax borrowings balloooned and until the Labor aristocratic stench had snubbed the voters who put them there. Now the Liberals have returned on the rebound, set forth sacking everyone to save money so they can rebuild their taxpayer Treasury wealth and pursue a different promised agenda. Voters go from boom to bust between Labor and Liberal, time after time again. It is about time we put an end to this see-saw party politics perpetuating the Liberal-Labor (LIbLab) merry go round. It only serves Liberal agenda’s then Labor agendas. The Labor Party has become the Foreign Labor Party, chasing the migrant vote, turning its back on traditional Australia, legislating to marginalise Australian union hard fought rights and workplace causes. Liberals as soon as they get power, privatise public assets as if they had a right. Forget the Greens unless you want Australia to become like Asia, Asians included. Vote Australia First, because only then Australians come first always, not foreigners, not the elite party donating corporates, not the urban rich, but ordinary Australians – rural Australians, working Australians, underclass Australians. How can you be sure? Because Australia First shall initiate Citizens Initiated Referenda – it is our policy to. Australians shall choose to vote when they want to. No more suffering for 4 or 5 years to get rid of LibLab Aristocrats reneging on their electoral promises! Our Western Living Standards are not for Compromise!